Saudi Arabia was once the kingdom of easy living. Sitting on the world’s second-largest proven oil reserves, Saudi citizens enjoyed free comprehensive healthcare and heavily subsidised water and electricity, and their streets were lined with SUVs. With petrol cheaper than water – just 16 cents a litre – few worried about oil consumption. And thanks to generous unemployment benefits supplemented by occasional cash hand-outs, Saudi nationals rarely worried about jobs either. Now the crude oil price is plateauing at around $50 per barrel, less than half of what it was two years ago. Given that less favourable oil prices are forecast for the coming decade, the Kingdom’s mounting fiscal deficits – equivalent to roughly 20 percent of GDP – are serious grounds for concern. 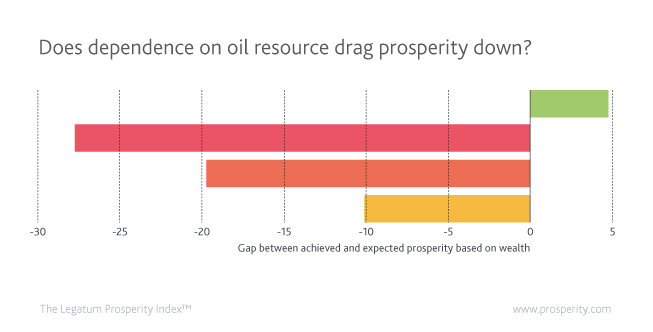 Oil dependence has a significant effect on prosperity delivery across the world, particularly in MENA, where ongoing problems with insurgency and instability contribute also to prosperity deficits. Benefits from crude oil have provided wealth but not prosperity. Despite being the 11th-wealthiest country globally in terms of GDP per capita, Saudi Arabia is ranked only 85th on the 2016 Prosperity Index, the lowest of the six Gulf Co-operation Council member states. The Kingdom has one of the world’s largest “prosperity deficits”, revealing alarming inefficiency in transforming the vast oil windfall into economic and social progress. The authoritarian political system is evidenced in the Kingdom’s weak performance in the Governance and Personal Freedom sub-indices. The ability to maintain stability in the country, based on a bargain of a wealthy lifestyle for the population in exchange for acquiescence in the family’s rule, may start to weaken as oil prices decline. The real obstacle, however, to the fostering of a truly prosperous Arab nation commensurate to its remarkable wealth lies in its economic system. According to the IMF, over 80 percent of Saudi Arabia's exports in 2014 were generated from oil and refined products, while oil revenues made up 90 percent of the government’s incomes. Like many other oil-rich countries, Saudi Arabia built almost the entire economy around the petroleum industry. According to the IMF, over 80 percent of its exports in 2014 were generated from oil and refined products, while oil revenues made up 90 percent of the government’s incomes. A highly capital-intensive business, the oil industry is by nature not a powerful employment generator. It diverts talent and capital that could be applied to innovation and economic diversification, crowding out the private sector and broader job creation. Most of the jobs created in infrastructure and the service sectors go to low-cost foreign workers. Consequently, the government has to sustain a disproportionately large public sector to accommodate a growing younger population: approximately two-thirds of Saudi workers are employed by the state, a situation not unique among Gulf states. Less than 60 percent of the labour force and barely one-fifth of women are actively seeking a job; unemployment rates among Saudi nationals hover at around 11 percent. All this represents a huge monument to the waste of the country’s talents. Fully aware of the public sector’s difficulty in meeting the increasing demands for jobs, the government has now turned to the private sector. But companies face quotas for Saudi employees and those hiring foreigners may incur extra fees. Such distortionary labour policies dissuade potential entrepreneurs and foreign investors. Innovation and productivity inevitably suffer. In the Business Environment sub-index of the Prosperity Index, Saudi Arabia ranks 25 places below its major regional competitors, the United Arab Emirates (UAE) and Qatar, both of which have a more diversified economy. However, the Saudis are not the only victims of overdependence on the oil industry. On average, oil-dependent countries (defined as those whose oil rents exceed ten percent of total GDP) rank 22 places lower than what their level of wealth would suggest. In comparison, countries not reliant on oil as a main source of revenues over-deliver by an average of four points. As the chart opposite shows, countries with high oil dependency perform significantly worse on both actual prosperity level and the ability to convert wealth into a prosperous life. Oil dependents: less prosperous and less efficient. 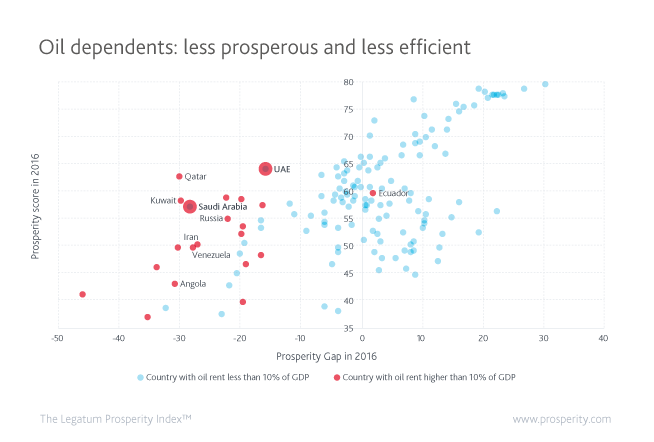 Oil-dependent countries on average have lower level of prosperity and are significantly under-delivering. Even allowing for geographical location, the inefficiency of oil-dependent countries is still striking. Political indicators aside, these states share lacklustre economies, restricted business environments, and poor educational attainment incompatible with their relatively high GDP-to-population ratio. Recent progress made by the UAE will perhaps provide a model for the region to move to a more diverse economy and prosperous society. Recent progress made by the UAE will perhaps provide a model for the region to move to a more diverse economy and prosperous society. The UAE has looked more to the OECD than to regional peers in its efforts to deliver prosperity. Policy decisions over the past decade have reduced dependence on oil and instead diversified the economy by encouraging the manufacturing and financial sectors. The UAE has become the Gulf’s business hub because of its openness to foreign investors, flexible labour policies, advanced infrastructure, easy access to credit, and the excise of British law. This in turn invigorated the economy and brought more jobs. Market liberalisation, exemplified by the introduction of a competition law in 2012, pushed the country further away from oil reliance by encouraging competition between and within sectors. These changes substantially improved the country’s performance in Economic Quality and Business Environment, which surged by 22 and 19 ranks respectively within a decade. By 2016 the UAE had the highest prosperity score among all oil-dependent countries globally and had almost erased its 20-rank deficits in the economy-related sub-indices. The UAE’s experience shows that oil is not destiny. With the right incentives, countries endowed with oil reserves can escape the grip of oil reliance and create a dynamic economy, thereby increasing overall prosperity.